Today, 5th grade students at Adam Clayton Powell Jr. Academy in Chicago got a surprise. 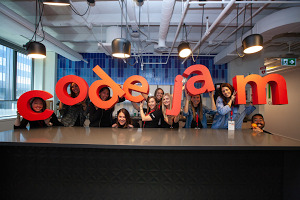 It was cool enough that they were doing a coding activity with Chicago Googlers as a part of Computer Science Education Week—but then another Chicago native joined the fun. When Chance The Rapper arrived, there were shouts of excitement and delight, and Chance even gave coding a try. SocialWorks, a non profit co-founded by Chance, is on a mission to expose youth across the city to programming and to ensure they have the support necessary to reach their full potential—with access to arts, music, and coding as a means to express themselves. Today’s visit reinforced that computer science is a part of that mission. Shortly after Chance made his coding debut, Alphabet Senior Vice President of Corporate Development, David Drummond, announced that Google.org is donating $1.5 million to to bring computer science education to students in Chicago, with $500,000 going to Chicago Public Schools’ CS4All Initiative and $1 million to SocialWorks. A student shares her coding project with Chance The Rapper. Chance shares his own coding project with the class. Chance hangs out with some students in the classroom. Chance speaks to the students at Adam Clayton Powell Jr. Academy. I’ve built my own career around computer science. At Google I helped create CS First, video-based lessons that introduce students to computer science and show them coding is a tool that, in the words of the SocialWorks mission, “lets you be you.” As a kid raised in the U.S. Virgin Islands, I didn’t know that I’d one day graduate with a computer science degree and end up at Google. All I knew was that I was fascinated by gadgets, which one day led to learning about the software that made them work on the inside. 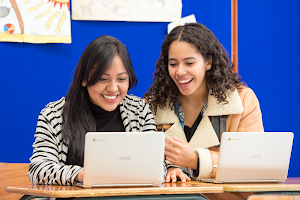 With the support of Google and SocialWorks, students in Chicago can also find out how their interests are connected to computer science, so that they can use those skills to build the future they imagine. These kids will always remember the day they met Chance The Rapper. We hope they’ll remember it as the day they discovered an interest in coding, too.